The Trans-Siberian Orchestra is an American progressive rock group. They were founded around 1996. They became popular around 1999. This was when they began touring with their second studio album, The Christmas Attic. Both Billboard Magazine and Pollstar ranked them as one of the top ticket-selling groups in the first decade of the new millennium. ↑ 1.0 1.1 1.2 1.3 1.4 Kerestan, Greg (December 17, 2014). "BWW Reviews: TRANS-SIBERIAN ORCHESTRA Opens 'The Christmas Attic' at Consol Energy Center". Broadway World Pittsburgh. Retrieved October 23, 2015. ↑ Fuoco-Karasinski, Christina (7 December 2010). "SoundSpike Interview: Trans-Siberian Orchestra's Paul O'Neill". Soundspike. Retrieved 13 September 2011. The progressive rock band is known for its live shows complete with an orchestra, a massive light show, lasers, dozens of pyrotechnics, moving trusses, video screens and other effects that are synchronized to the music. ↑ "Christmas concerts: Straight No Chaser, Trans-Siberian Orchestra, Chicago, Brave Combo, more". Chicago Sun-Times. Sun-Times Media Group. November 11, 2011. Retrieved October 23, 2015. 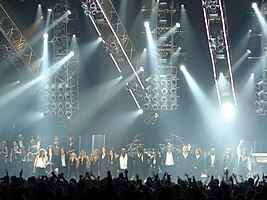 ↑ "How Trans-Siberian Orchestra Became a Holiday Hit Machine". The Wall Street Journal. Retrieved November 23, 2016. ↑ "Top Touring Artists of the Decade". The Billboard. Retrieved November 23, 2016. This page was last changed on 13 April 2018, at 11:13.